It’s a little known fact outside of the Netherlands that one third of this tiny country – if it weren’t for a couple of great big hulking dijks - would be submerged under rather a lot of water. Left to Mother Nature, Schipol Airport would in fact be a lake (it’s 3 meters below sea level), and rural North Holland – where I used to live – should actually be reclaimed by the North Sea. 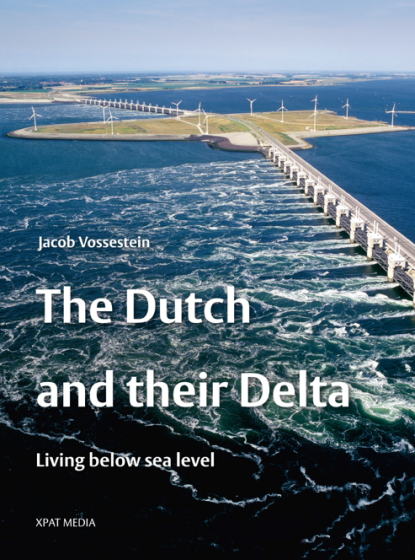 Jacob Vossestein (author of Dealing with the Dutch) has written a whole book about the Dutch nation’s preoccupation with keeping water out of their clogs, and The Dutch and their Delta: Living below sea level, is his recent offering. This bible-sized compendium is a delight for anyone living in the Netherlands past or present who has ever wondered even a little bit, about the intricacies of pumping the ocean out of the Lowlands. With signs of their predicament everywhere in the form of windmills, canals, polders and huge grass-covered clumps of earth all holding back the waves, one can only marvel at the Dutch world-leading ingenuity when it comes to water management. You don’t have to be an engineering nerd to wonder how it all works, you just have to stare at the sea from the top of a dijk during a storm, to understand the sense of fear and foreboding these people must have felt in olden days. With 300 pages of excellent photographs and descriptive explanations, Vossestein’s enthusiasm for the topic, and his obvious love for this amazing little country shine through. The Dutch and their Delta: Living below sea level is a surprisingly fascinating read, and a perfect addition to any self-respecting Dutch coffee table. For a taster of what to expect, see Jacob Vossestein’s youtube video about The Dutch and their Delta.